This pizza is rather tasty and simple. Much like all of my other recipes. I think that homemade alfredo is much better than store-bought, but if you're in a hurry than alfredo in a jar works just as well. You can add other ingredients such as chicken or other vegetables to make this even tastier. 1. Preheat oven to 400 degrees F. Bring large pot of water to boil; add broccoli. Cook about 3 minutes. Drain. 2. Stir seasoning into alfredo sauce along with the garlic powder; spread over pizza crust within 3/4-inch of edge. 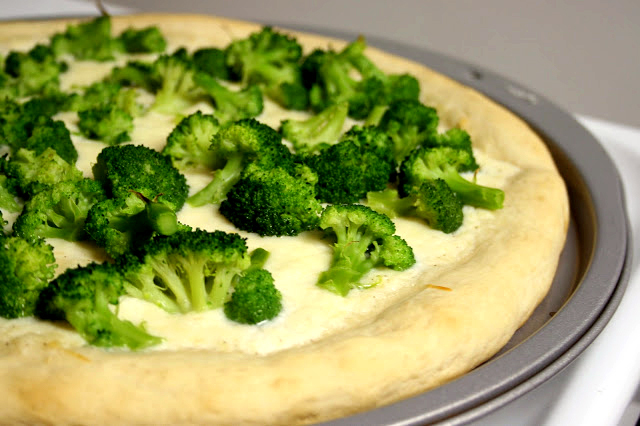 Top with broccoli; sprinkle with cheese. 3. Place pizza directly on oven rack. Bake until hot and cheese is melted, 15 minutes.